Foot & Ankle injuries commonly occur during sporting activities such as running and jumping. Conditions that affect the foot can be caused by direct injury, repetitive overuse or poor foot posture such as flat footedness. Treatment at Platinum Physiotherapy will initially involve assessing your pain, range of movement, muscle strength, balance and stability. Your physiotherapist may also look at your footwear to assess whether your ankle problem is biomechanical and related to your foot posture and the position of your knees and hips. Following an initial assessment, your physiotherapist will develop a progressive treatment program in order to restore your physical function and proprioception (awareness of limbs in space) and get you back to the activities you enjoy as quickly as possible. The key to successful treatment of Achilles pain is early diagnosis and RICE (rest, ice, compression and elevation). Our physiotherapists provide specific stretching and strengthening programmes and correction of predisposing factors such as muscle tightness and abnormal biomechanics. These are all required together with appropriate progression to functional activities and sport-specific rehabilitation programmes. Your treatment program will be tailored to your needs and lifestyle to ensure you make a speedy recovery and reach your maximum potential. At Platinum Physiotherapy, treatment will aim to significantly reduce pain and inflammation in the initial phase of Achilles tendonitis and then gradually improve muscle strength and flexibility to ensure an optimal outcome. Your physiotherapist will guide you through an individualised exercise program to ensure you make the best possible recovery and return to your sport as safely and as quickly as possible. A sprained ankle is a condition characterised by damage and tearing to the soft tissue and ligaments of the ankle. The most commonly affected ligaments in this condition are the lateral ligaments. An ankle sprain is commonly caused by activities requiring rapid changes in direction, especially if these take place on uneven surfaces (e.g. grass fields) such as in football or netball. 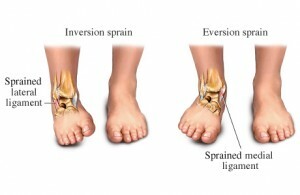 What are the symptoms/effects of an ankle sprain? Diagnosis of an ankle sprain can be made by a physiotherapist or doctor who will take a thorough look at your ankle and assess swelling, pain, movement and strength. An X-ray may be required to see the extent of the injury and rule out other injuries (particularly fractures). At Platinum Physiotherapy we provide specialised assessment and treatment for people with ankle sprains. Your treatment programme will be centred on your lifestyle to increase sporting performance and reduce the risk of recurrence. Physiotherapy will accelerate healing and get you back to your sporting activities as quickly as possible. Footballer’s ankle is the name given to the dislocation of the peroneal tendons that are located behind the bony point on the inner side of your ankle (malleolus). An ankle sprain can be the cause of Footballer’s Ankle as long as the dislocation of the peroneal tendons occurs as a result of the sprain. 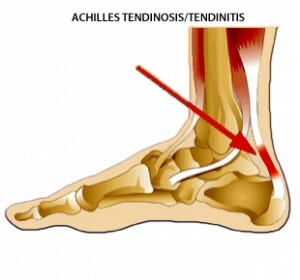 A direct kick to the tendon can trigger the injury and this is the cause of its name, Footballer’s Ankle. The tissue stabilising the peroneal tendons can sometimes be torn when an ankle is turned over and the tendons can relocate themselves on the wrong side of the malleolus. When this occurs repeatedly, it causes great damage to the tissue, resulting in inflammation. What are the Symptoms of Footballers Ankle? Footballer’s ankle causes great pain on movement of the foot. Other symptoms are swelling, bruising and tenderness and pain behind and around the malleolus. Diagnosis of footballer’s ankle can be confirmed by a physiotherapist or doctor following a thorough subjective and objective assessment. An X-ray may be required to see the extent of the injury and rule out other injuries, such as fractures. Your physiotherapist at Platinum Physiotherapy will initially assess your foot and ankle to diagnose the injury and identify possible causes. A rehabilitation program will then be developed to promote healing, restore full flexibility, strength balance and proprioception and reduce reoccurrence of the injury. Plantar fasciitis is damage and inflammation to the connective tissue on the sole of the foot forming the inner arch (plantar fascia) causing pain in the heel. Plantar fasciitis is commonly caused by biomechanical abnormality, such as excessive pronation (flatfootedness) or supination (high arch) of the foot. Plantar fasciitis may also be caused by calf tightness or repetitive overuse such as walking excessively especially up hills or on uneven surfaces. What are the symptoms/effects of plantar fasciitis? The main symptom of plantar fasciitis is pain underneath the heel and along the inner sole of the foot, which is worse in the morning and when walking or running. Physiotherapy treatment will reduce pain and accelerate healing so that you can get back to your sports and everyday activities as quickly as possible. Early physiotherapy treatment is vital to speed up recovery and ensure you make significant improvement in the short and long term. Your physiotherapist will also devise an appropriate return to activity plan so you can return to your daily tasks and hobbies with confidence and success, as soon as possible. Fat pad syndrome is characterised by pain over the centre of the heel which often feels like a deep bruise. The fat pad aids in cushioning and protecting the heel. When the heel gets injured, the fat pad stretches losing some of that cushion, which can make weight bearing very uncomfortable. What causes fat pad syndrome? Fat pad syndrome can be caused by a direct blow to the heel such as fall onto the heels or chronically from excessive heel strike with poor heel cushioning. What are symptoms/effects of fat pad syndrome? Pain in the heel, usually on the middle of the heel which is aggravated by walking barefoot on hard surfaces like ceramic tile, concrete, hardwood floors, etc. A deep, dull ache that feels like a bruise. Physiotherapy treatment will reduce your pain and accelerate healing and cushioning of the heel so that you can get back to your hobbies much quicker and with more confidence. An initial assessment at Platinum Physiotherapy will confirm a diagnosis and identify the cause of your injury. Taping the heel to provide pain relief and compress the soft tissue under the heel giving more protection to the bone. Physiotherapy treatment will be tailored to your current symptoms and lifestyle to ensure you make the best progress and continue you to make long term improvements. 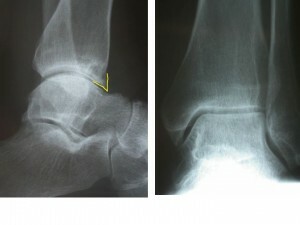 A calcaneal stress fracture is fracture of the heel bone (calcaneus). What causes a calcaneal stress fracture? Calcaneal stress fractures are usually caused by repetitive force going through the heel bone in weight bearing activities such as marching or running. Sometimes stress fractures of the calcaneus occur when people increase their activity or change their training conditions. What are the symptoms/effects of a calcaneal stress fracture? The main symptom of a calcaneal stress fracture is pain on either the inner or outer aspect of the heel bone that increases with impact activity such as marching, running, jumping or landing. Other symptoms may include night ache or pain on firmly touching or squeezing the heel bone. Physiotherapy treatment for a stress fracture of the calcaneus initially involves a period of rest which may involve protective weight bearing using crutches or wearing a protective boot. Your physiotherapist at Platinum Physiotherapy will then use a combination of hands-on techniques and exercise to promote bone healing and get you back to your normal activities as soon as possible. Physiotherapy treatment will not only speed up your recovery but also ensure get back to your sport and hobbies with confidence and success. What is a joint sprain? A joint sprain is characterised by damage or tearing of the connective tissue (such as ligaments, cartilage and joint capsule) of one or more joints in the foot. What causes a joint sprain? A joint sprain in the foot is caused by an awkward movement such as twisting or bending or landing on an even surface during activities such as jumping, running, gymnastics and football. Sometimes, a sprained foot will occur due to repetitive strain associated with overuse and may occur in people with unstable foot types such as flat feet. What are the signs and symptoms of a joint sprain? A sudden onset of pain in the affected joint during activity is the initial symptom experienced if you have sprained a joint in your foot. Some people may also experience pain and stiffness after the activity, particularly the next morning and the area may be tender to touch. A joint sprain may also be accompanied by swelling, redness and bruising depending on the extent of the injury. Physiotherapy following a joint sprain will facilitate your recovery and get you back to your sport quicker. Our experienced physiotherapists at Platinum Physiotherapy will initially assess your foot looking at pain, swelling, movement and strength in order to develop a treatment program tailored to you. Physiotherapy will reduce pain and swelling, improve muscle strength and flexibility and ensure your foot is functioning correctly before returning to sporting and everyday activities. In cases of foot instability or poor foot posture, your physiotherapist will refer you on to an orthotist to maximise your recovery in the short and long term.